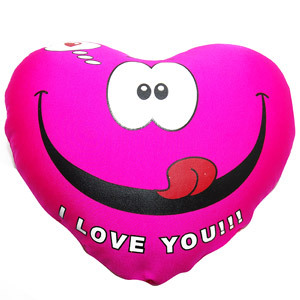 Spread the charisma of love on this occasion with this heart shaped love cushions. Decked in bright pink color, these cushions will impart a feeling of coziness to your love. The tongue-out face imprinted on the cushion will make your beloved remember the mischievous time that you two had spent together. Send this cushion to India for your loved one and let him/her price this gift for days to come. Please Note : The Colour of the Soft Toy might vary according to availability.